You can choose a one or two day Great Ocean Road tour from Melbourne. Some even include helicopter flights over the 12 Apostles. They all take you along the very scenic Great Ocean Road and the Surf Cost, the rainforests of the Otway Ranges, and the Twelve Apostles and other limestone formations of the shipwreck coast. The Great Ocean Road Small Group Eco Tour is the most popular Great Ocean Road tour from Melbourne, especially appreciated for its small size and great information. 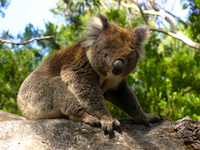 It is a 13 hour personalised tour, including many stops, koala spotting and rainforest walks at the Otway Ranges. And of course, the Twelve Apostles, where you have the option of taking a very affordable short helicopter ride to see the magnificent coastline from the air. It then continues along the Shipwreck Cost, where you get to see the formations of the Loch Ard Gorge and London Arch. This operator was awarded the Best Tour & Transport Operator of 2007 Australian Tourism Award. The Great Ocean Road Day Trip Adventure is another popular day trip along one of the world's great coastal drives, the Great Ocean Road. The knowledgeable driver explains historical and botanical information of the wild scenery, rainforests and pristine beaches, as well as the Twelve Apostles and rugged Shipwreck Coast. You’ll drop past the world-famous Bells Beach and into the seaside town of Lorne. At the 12 Apostles you'll have the option of taking a helicopter flight over the dramatic Shipwreck Coast. This Great Ocean Road tour then continues to Loch Ard Gorge and the scenic town of Port Campbell. There is a lot of driving involved in a Great Ocean Road tour – over 500 km. Some people prefer to have some extra time to hang out in one of the seaside towns. The Great Ocean Road 2-Day Adventure Tour will give you an extra day to enjoy either Apollo Bay or Lorne, where you will spend about 24 hours and stay overnight. This breaks up the long drive, which as in other tours takes you along surf cost past Bells Beach, the rainforest and then to the lime stone stacks of the Twelve Apostles and Loch Ard Gorge. They also make you traditional Aussie billy tea with vegemite crackers and lamingtons. The Great Ocean Road Shipwrecks and Wild Clifftops Luxury Small Group Ecotour is a popular 10 hour luxury day tour. You travel in a small group, in luxury vehicle with a knowledgeable driver, which makes it a more intimate and comfortable way to explore this coast. You get to see the Otway Rainforest, the famous12 Apostles rock formations, the London Bridge and get to listen to the intriguing shipwreck story at Loch Ard Gorge that gave it its name. It includes morning tea as well as lunch at Port Campbell. This private Great Ocean Road Helicopter Tour takes about 6 hours along the coast and to the Twelve Apostles and Shipwreck Coast. It is the Great Ocean Road tour with a difference and in V.I.P. style. It includes refreshments, the 12 Apostles boardwalk and a picnic lunch near the famous rock formations. You get picked up in a limousine or Range Rover Sport and taken to your own private helicopter. The flight along the majestic coast line is a fantastic experience, with your pilot dipping down to do beach runs, circling the rock formations, and then flying high so you can take in the enormity of the Great Ocean Road coastline. If there are other things you want to see in Melbourne, an affordable and popular option is the 2-Day Combo: Melbourne City Tour, Yarra River Cruise and Great Ocean Road Day Trip You can do this on any two days within a 7 day period. This combo package includes three of the most popular Melbourne tours with a saving of over 15%. You get a whole daytour to the Great Ocean Road. This includes a stop at Bells Beach or Torquay for morning tea, Apollo Bay, and then continues to the highlight of the Twelve Apostles. The other day you get to do a Yarra River cruise, a discovery Melbourne tour and a trip to the Dandenong Ranges, all complete with “bush billy tea”. Here is a list of Great Ocean Road Tours.